I don’t have a lot of interest in pleasant music. Yes, I can hear that it’s soothing, but I can’t figure out why you’d want music to soothe you. I want music to snap me out of it, to communicate something new in an interesting, dynamic way that’s impossible to refute. So, it’s easy to see why I like a lot of what I like: Roxy Music, Talking Heads, David Bowie, the ubiquitously written-about (here, anyway) Pere Ubu, TV on the Radio, Frank Zappa, Sonic Youth, Van Dyke Parks-era Beach Boys, King Crimson, and the like. What are the common elements? Intellectualism, contrapuntalism, dissonance, and surprise. What else do many of them have in common? Brian Eno. It’s impossible to track the music I like without repeatedly stumbling across the name Brian Eno. The best Bowie albums? (Lodger, Low, “Heroes,” Outside.) They all featured Eno writing, producing, providing “atmospherics,” or a combination of all three. Same with the three Talking Heads albums truly worth owning, including the astonishing Remain in Light. Eno has had the immense good taste or good fortune to work repeatedly with the likes of Robert Fripp, Harold Budd, John Cale, Philip Glass, David Byrne, and many others, and I’ve gotten this far without mentioning another act he’s produced by the name of U2 because their music does nothing for me. Along the way, he invented ambient music and made a lot of money doing so. The past few years, Eno, who is also a painter, and is a painter in a similar way that he is a musician albeit with more training, has been doing installations of changeable art created by a random shifting interplay of abstract images, shown against a backdrop of ambient music. 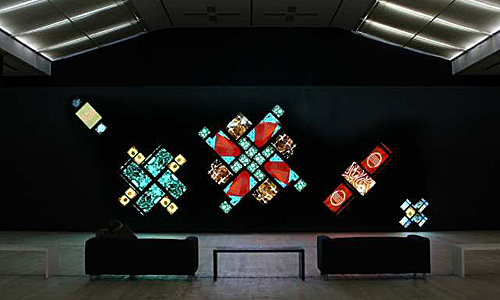 He’s now brought that show, “77 Million Paintings,” to Long Beach, where I’ll be seeing it on Sunday with a friend similarly well-versed in all things Eno before, miracle of miracles, we’ll also catch a lecture by Eno at the Carpenter Center that evening. Yes, I got those tickets almost as soon as the event was announced; good thing, too, because the lecture sold out almost immediately. I’ve been following Eno and his work with great interest for 30 years, and this is the first time he’s made an appearance anywhere near me, so I wasn’t going to miss out. Expect more here after the event. Frank Zappa is dead, but judging from some news coverage this week his legacy is doing nicely. That’s despite (or because of?) his widow’s propensity for suing people who play his music live without authorization. (So, Zappa Plays Zappa, featuring son Dweezil, is sanctioned. Others? Not so much.) Problem is, the law does not seem to be on her side. This controversy and more is covered in an NPR piece from yesterday. Here’s the link, where you can read the transcript or, better yet — listen to the story complete with Zappa music. You have no idea my thrill at hearing sections of “Lumpy Gravy” and “We’re Only in it For the Money” coming from the radio in my car and not a CD. Dropped as it was on me in such a surprising way, I was struck again my Zappa’s inventive genius. As Rolling Stone’s David Fricke is quoted in this piece, “It’s almost as if Frank Zappa was writing avant-garde classical music in Top 40 segments.” I think that’s about right. Forty years later, it’s still astonishing. 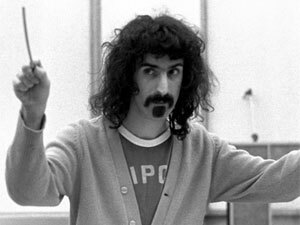 The other bit of Zappa news is this: Forget Nostradamus, who couldn’t predict his way back to wherever he left his car. It’s Frank Zappa who laid out the fundamentals and business model for filesharing and iTunes — back in 1989. And now he’s getting some credit for it. Brian Eno and David Byrne on their multi-decade collaboration, and why, for Eno, Frank Zappa provides an example of precisely what not to do in music. You are currently browsing the archives for the Zappa, Frank category. Dan: THANK YOU! And by the way, the Warren bio is an excellent choice. Lee Wochner: Email me your mailing address and one will be yours!